Info In December 2003, Kamala Harris was elected as the first woman District Attorney in San Francisco's history, and as the first African American woman in California to hold the office. She was overwhelmingly reelected to a second term in November 2007. Harris was born in Oakland, California and raised with her sister Maya in the East Bay by their mother Dr. Shyamala Gopalan, a breast cancer specialist. After attending public schools, her strong commitment to justice and public service led her to Howard University, America’s oldest historically black university, and then to the University of California, Hastings College of the Law. Harris has spent her entire professional life in the trenches as a courtroom prosecutor. After graduating from U.C. Hastings College of the Law, she took a position in the Alameda County District Attorney's Office, where she specialized in prosecuting child sexual assault cases. As a Deputy District Attorney she also prosecuted cases for homicide and robbery. She worked at that office from 1990 to 1998 before going on to serve in the San Francisco District Attorney’s Office. 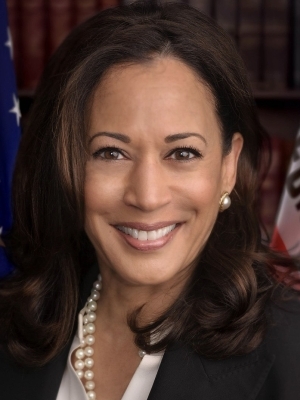 In 1998, Harris was named managing attorney of the Career Criminal Unit of the San Francisco District Attorney’s Office, where she prosecuted three strikes cases and serial felony offenders. She then served as the head of the San Francisco City Attorney’s Division on Families and Children. As San Francisco DA, Harris - who has been a prosecutor for nearly twenty years - has focused intensively on fighting violent crime. She has increased conviction rates for serious and violent offenses, expanded services to victims of crime and their families, created new prosecution divisions focused on child assault, public integrity and environmental crimes, and launched innovative re-entry initiatives to prevent re-offending. To combat one of San Francisco’s biggest challenges, gun violence, she created a gun specialist team and implemented tough gun charging policies. This work is paying off --- the San Francisco District Attorney’s Office has more than doubled its trial conviction rate for gun felonies to 90 percent. Under her leadership, the office has sent 50 percent more serious and violent offenders to State Prison, has put more than 220 gang members behind bars and convicted more than 1,200 domestic violence offenders. According to the San Francisco Superior Court, the office’s overall felony conviction rate is at its highest point in 12 years. Harris has brought much-needed consistency and innovation to the handling of narcotics and quality-of-life crimes. Her office has tripled the number of misdemeanor cases taken to trial, and Harris has assigned senior prosecutors to specialize in prosecuting graffiti, vandalism and auto burglaries. She has also launched unprecedented programs of outreach to San Francisco communities and brought free legal clinics to immigrant neighborhoods. District Attorney Harris is the recipient of numerous awards. California’s largest legal newspaper, The Daily Journal, designated Harris as one of the top 75 women litigators in California – the only elected official to receive that honor – as well as one of the top 100 lawyers in the state. She was recognized as a “Woman of Power” by the National Urban League and received the Thurgood Marshall Award from the National Black Prosecutors Association. She has been featured on the Oprah Show and in Newsweek as one of “America’s 20 Most Powerful Women.” She was selected as one of 24 elected leaders from throughout the country to serve as a Rodel Fellow with the Aspen Institute. Additionally, Harris was elected to the Board of Directors of the California District Attorneys Association and is a Vice President of the National District Attorney’s Association.